This recipe will make 6 or 7 substantial burgers, so you can wrap them up in cling film and freeze some for later. Alternatively, you could use this recipe to make meatballs to serve with spaghetti and a tomato sauce. Put the minced beef in a large mixing bowl with the onion, garlic, breadcrumbs, parmesan, ketchup and parsley and season with a little salt and pepper. Add the egg and mash the mixture together with your hands, using the egg as a binding agent. Divide the mixture into six or seven burgers. Using a little plain flour, shape them into your desired shapes about 1.25cm thick. Allow to rest in the fridge for at least 30 minutes. Heat a large frying pan with a little oil. Pan-fry the burgers for 2 minutes on each side, until golden brown, then place on a baking tray. Cook in the oven for 10 to 12 minutes more to make sure that they are cooked through. To decorate, slice into the centre of the burger and add a teaspoon of ketchup, or more if you want 'blood' dripping from the mouth. 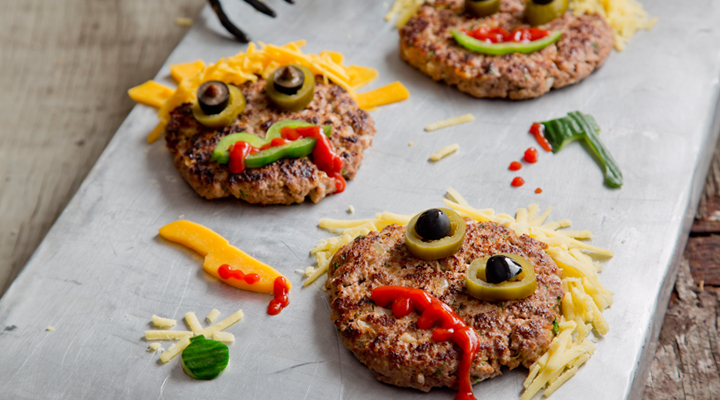 Use jalapeños as eyes and black olives as the pupils and use grated cheddar cheese to create the hair.